Sick with nostalgia, drag artist Adoracion returns to Havana from Miami to ask his nephew Ismael for a final favour. But both Ismael and Havana have changed beyond recognition and Ismael's lover Isaac is not the only obstacle to Adoracion's wishes. Thanks to Claire from the Royal Court Theatre for the information. Norge Espinosa Mendoza was born in Santa Clara and is a published poet, critic and playwright. He works as the Resident Dramaturg at Teatro Publico in Havana. His most recent play ICARUS was staged there and won the Critics Prize of 2003. Norge has been part of the Royal Court Cuban Playwrights Projects since 2002 and received a British Council Bursary to attend the Royal Court International Residency in the Summer of 2003. Thanks to Marysia for this excerpt and for alerting us to this production. p Marysia's review here. Born 4 March, 1969 in London, Jez Butterworth was brought up, with his brother Tom, in St. Albans and educated at Cambridge University. Together with his brother he wrote THE CENSUS MAN as part of Carlton Television New Writer Course. This led to their being commissioned in 1993 to make THE NIGHT OF THE GOLDEN BRAIN, a short film about a pub quiz team, (GOING UNDERGROUND series). Jez then wrote his first stage play MOJO, which opened at the Royal Court Theater in 1995 and was an incredible critical and public success, with the play winning the Olivier and Evening Standard Most Promising Playwright Awards. He then teamed up again with Tom to co-write CHRISTMAS (1996), a modern morality tale about a teenager, set in London, which was broadcast on Channel 4 and directed by Mark Munden. 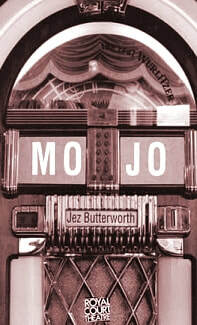 With MOJO, Jez Butterworth makes his debut as a feature film director.